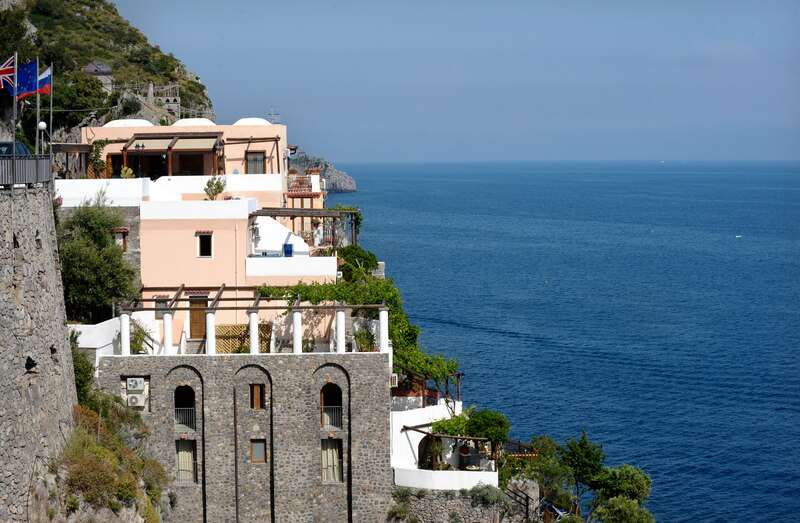 Find out more about Hotel La locanda del Fiordo thanks to the reviews of tripadvisor and other portals of guests who have stayed in Furore on the Amalfi Coast. Thanks to the many beautiful reviews of guests who have spent the holiday in our Hotel by the sea in Furore on the Amalfi Coast, also for 2017 we got the coveted Certificate of Excellence of Tripadvisor that adds to the list of awards we had already obtained in the past and that gives us the right incentive to face a 2018 season trying to always give our best to satisfy our customers and reconfirm our quality at the top. It’s difficult to know where to begin, but I’ll start with the service which is excellent from start to finish - the owner Luigi is a real gent. You access the hotel straight off the road onto the upper terrace of the restaurant - taking a drink watching the antics on that tiny, busy road is quite something. However, why should you when you’ve only to turn 180 degrees to see a view of the cerulean depths which is simply stunning. The second, smaller dining terrace just below the main one is the place to choose for your evening meal though, watching the sun set from there whilst enjoying great food, decent wines and the company of a loved one (if that’s what floats your boat) is a wonderful and memorable experience, not to be missed. The room accommodation is good, with that view again, comfy beds & efficient air conditioning. I made a mistake with my booking for this hotel and the management could not have been more helpful in fixing my mistake in a timely manner. Booked for 2019 instead of 2018, rather silly mistake, but made right thanks to the manager. As a result whilst we cannot stay there (they are fully booked) we will be dining at the restaurant. Thank you again. "Great place to stay on the Amalfi Coast"
After coming off a tour of Italy, my friend, Bill and I decided to spend three days at La Locanda del Fiordo in Furore. The hotel has a fantastic view of Mediterranean Sea. Our room was quaint and cozy and the patio adjoining our room was perfect. The owner, Luigi was the perfect host. The food was great. We took the SITA bus from the hotel and visited the towns of Amalfi and Ravello. Will definitely go back to La Locanda del Fiordo. We found this boutique hotel purely by chance. We were tired of dodging bicycles, motor bikes and pedestrians on the Amalfi Coast. We pulled over once we saw the sign Hotel, Restaurant and Bar. Large pad for parking. For those who have never been to Amalfi Coast, parking space is at a premium, so a hotel with Free parking is a plus! We sat down ordered wine and beer while overlooking the water and cliffs. One of the team showed us the Standard Room and the Deluxe. The standard room doesn't feature a window with a view , but does offer patio seating . The Deluxe Room has the WOW factor! We walked into the room to see the arched window open with a gentle breeze blowing the sheers. The window opens to the floor and overlooks a grotto. The views are unmatched with private garden patio . It was impossible to say no to this once in a lifetime find. Wonderful service and an amazing view. Fantastic, very friendly service at all times. Lovely comfortable bed and all we needed in the room. Magnificent views and lots of outlooks for a little sunbake and hot tub. Lovely restaurant and fantastically fresh fish each evening. Pistachio cheesecake was divine! The most romantic place on earth. We randomly chose this hotel to stay last year in September 2016. This where I had to propose once I saw the place. And the staff are so accommodating, the food is amazing that people come from all over to eat at their restaurant. The view at night is breathtaking. We dove off the cliffs into the Mediterranean at the bottom of the hotels stairs where you can sunbath. Warning for those with problems with stairs though, there are many and they are steep. A great place in the Amalfi Coast with gorgeous views, great rooms, fantastic food and a great and friendly staff, thank you Luigi and team for giving us 3 days of absolute perfection in the Amalfi Coast. Will not hesitate to come back if I’m ever once again in the area!!!!!! Copyright Pyramide.it © 2017. Tutti i diritti riservati.